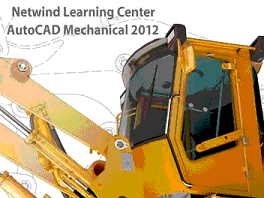 Instuctor led training will familiarize students with AutoCAD Mechanical training 2012 features, such as the Mechanical 2012 User Interface, Drawing Commands, Content Libraries, the 2D and 3D drawing and editing features used to create and modify content with industry-specific mechanical features. You will learn to use the powerful annotation tools and dimensioning, how to utilize intelligent objects to streamline design, and the basic customization of your user interface. With our AutoCAD Mechanical training course you will become efficient in the software and save hours of design time, allowing you to work more productively. Our AutoCAD® Mechanical 2012 Training DVD consists of over 123 video lessons, spanning over 8 hours on DVD and it also includes training for AutoCAD 2012 essentials with more than 12 hours of AutoCAD training. AutoCAD Mechanical is a design and drafting tool for manufacturing, and is used to accelerate the mechanical design process. Our AutoCAD Mechanical training dvd will show you how to work more efficiently and teach you to save hours of design time by automating common design tasks. Robert Stein is a technical consultant who has worked in varying roles over the years as a designer, CAD manager and consultant at a variety of companies. Robert has worked on a number of large scale implementations and custom programming projects . He is a veteran in the mechanical discipline with experience in customization, programming and support.